Thank you to Stacey Dooney, Dr. Falkenberg, students, staff and parents from Pelican Marsh Elementary School for the invite to their school today. 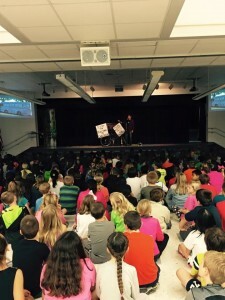 Eight-hundred students were all ears in the three assemblies promoting kindness. Bogart was the main attraction! This entry was posted on Friday, February 6th, 2015 at 3:32 pm	and is filed under Kindness. You can follow any responses to this entry through the RSS 2.0 feed. You can leave a response, or trackback from your own site.